Organizing kid items can take some time, so try not to get discouraged if you’re not completing tasks as quickly as you’d hoped. Remember – your declutter schedule may be different from what I suggest – that’s okay! Just make progress. 1) Think about play time vs. clean-up time. If your children spend 15 minutes playing with something and it makes for an hour’s worth of cleanup, the toy is probably more work than it’s worth. Get rid of it. 2) If it’s broken, get rid of it. 3) If it has missing pieces, use your best judgement. 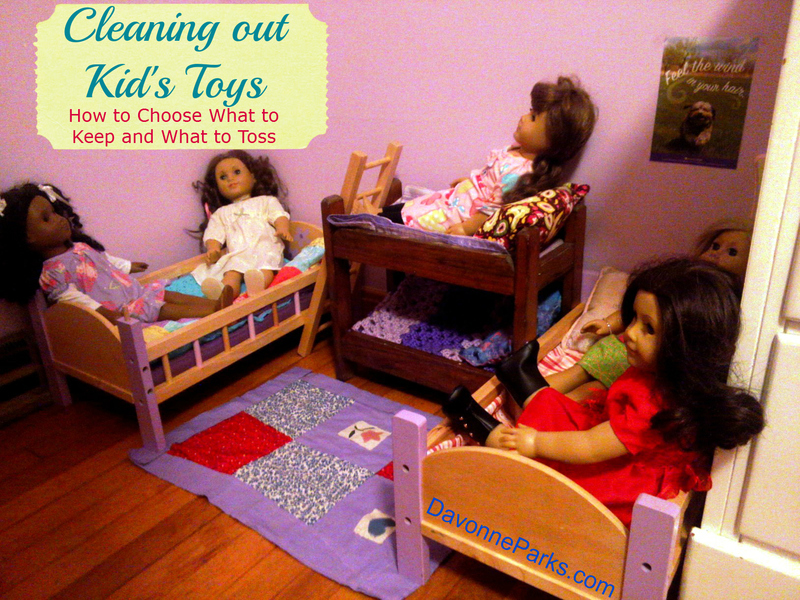 4) If your kids play only with a toy once every-other month, get rid of it. Only keep toys that they love and use often. 5) If they probably won’t miss it, donate it. 6) Have limits, or containers. When the bookshelf is full, it’s full. Don’t cram books – get rid of some instead. Likewise, when the toy box is full, it’s full. Don’t let them keep stuff beside the toy box. Instead, get rid of the things that aren’t the top favorites so everything can fit neatly into the designated space. 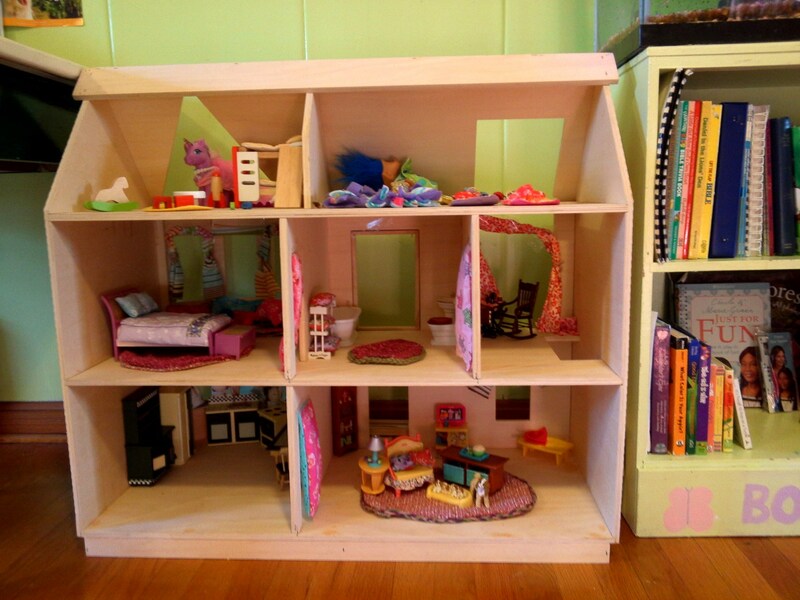 We do count doll beds as “containers” for helping us choose how many dolls to keep! 7) Use zip-top bags for organization. This is not the prettiest storage method, but it’s cheap and efficient. You can put legos into gallon size bags. Cars into another. Divide art supplies into yet another bag. Real life example: we have an art shelf. On that shelf is an art supply basket. Inside that basket is a bag for crayons, another bag for colored pencils, another bag for stencils and stickers, another for scissors, and so on. This way, my kids can grab supplies quickly on their own as well as put them back easily. 8 ) Be okay with knowing that you may make a mistake. You may accidentally get rid of something your children would have liked to keep. Don’t let that paralyze you. In all the dozens and dozens of van-loads full of items we’ve donated over the past several years, there have only been three items in those bags that my children have missed. I chose to give myself grace and realize that it’s okay to not do everything perfectly. I reminded my girls that we’d thrown two of those items away because most of the pieces were missing. They understand that keeping things clutter-free allows them to now have toys with little pieces that aren’t getting lost all over the place. For the first time ever, we can have toys with little pieces. Success! The other item came from the dollar tree and was no big loss. They figured out how to create their own version with supplies we had on hand. I’ve asked both of my children what they think about me getting rid of so much of their stuff. One child told me she’s glad I go through their things twice a year because if I never decluttered, the schoolroom would probably be packed to the ceiling with toys and books! Next week, I’ll have a Q&A about organizing special mementos and school papers. When my youngest daughter turned 18, she asked for a childhood toy. I couldn’t find it anywhere. How was I to know that would be the ONE thing she’d want after 5 years! (I had asked her at 13, if she wanted her box of toys, and she said no. She was with her father at the time.) I still feel guilt, but trying to let it go. Thanks for saying give yourself grace. Of course, the one thing she wanted wasn’t there, that’s always the way it works! Good for you for giving yourself grace though. My mom had gotten rid of my old My Little Pony Castle and I found the same version online to buy for my daughter when she started liking ponies. I promise that it was SO CLOSE to being as good as having my actual one! Maybe you could do something like that if your daughter still really wants the toy and see how it goes.